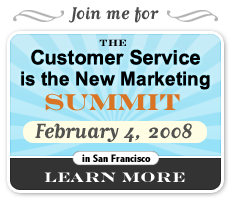 Customer Service is the New Marketing Conference Feb 4, San Francisco | Andy Sernovitz | Damn, I Wish I'd Thought of That! I’m quite looking forward to attending (but not speaking at) this fascinating conference. As a professional speaker, it’s rare for me to attend an event just for fun, but this one has an important message. Learn how smart organizations are turning customer service from just a cost center into an engine for building culture and creating evangelists. This conference brings together innovative business leaders from several industries to share tips and suggestions about how they got their own organizations to do customer service differently. Confirmed speakers include Tony Hsieh, CEO of Zappos; Alex Frankel, author of "Punching In"; Michael Murphy, head of customer service for Virgin; Robert Stephens, founder of The Geek Squad; and many more below. I’ll be bringing free books for attendees.